I really like how eco-friendly and creative felted cat caves can be. I have featured many beautiful ones that are available on Etsy (and some are so original they are no longer available) – and there are ones that are gorgeous that are also on Amazon. We have only reviewed #3, the CatGeeks Cat Cave, so I can only speak for that one being large enough for Ragdolls. Do you have a cat cave for your kitty? Which one did you get and why? Does your kitty like it? These are so beautiful! Emily loves wool and will lick anything that is made from it. #4 would look great with my decor- added it to my Amazon wish list. Maybe a Christmas present? Wow! Great post, Jenny! Lurve that selection of cat caves you found! I really lurve number 1 so much! So cute!!! We have a wool cat cave. I purchased it from The Cat Connection in August of 2014. It’s a beautiful blue & grey one. Miss Pink Sugarbelle has gotten in it three times in the 2 years we’ve owned it. 1. When it first arrived she checked it out and then after a second or two wasn’t interested in it anymore. 3. I put it on the living room floor with some catnip in it and she played with the catnip for about 5 minutes and then was done with the whole thing. mog i love all of those caves!! they are so pretty! 1, 8, 6, 9 LOVE! 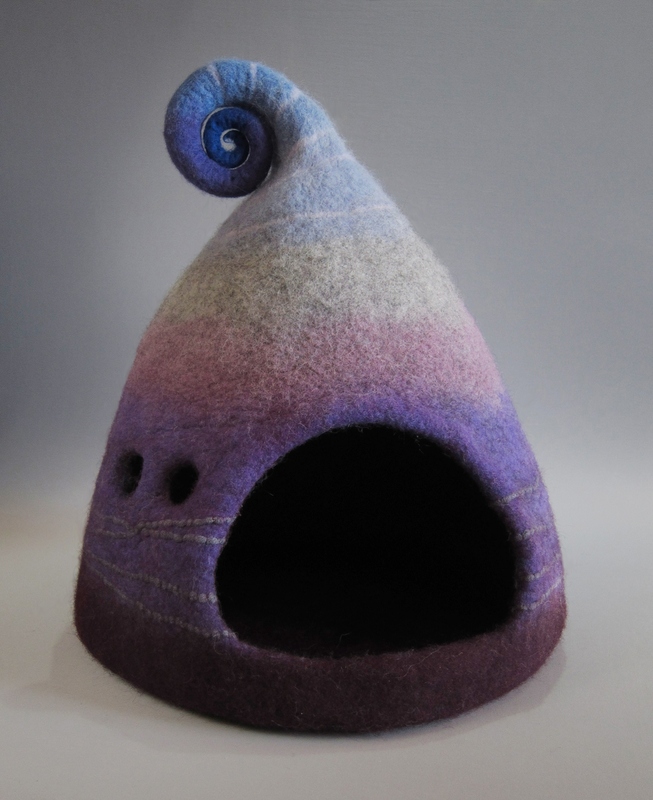 not sure you will be able to see this – a felted cat cave by felt field on etsy. Fede and I adore it! Hi Amy, I bought #3 and love it. Both my kitties fight over it, and like Patti, I also love #1, until I say your link to Easy. So different and purple too – my favorite color. Love it. How cool – hope you will share photos!